The Connect slate, led by second-year law student and now President-elect Renard Miller, beat out ChicagoSpirit and the Moose Party for 2012-2013. Editor’s Note: Douglas Everson is a Maroon staffer. 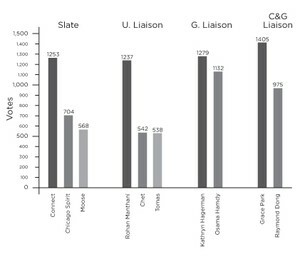 Cruising to victory on a platform of undergraduate and graduate student unity, Connect became executive slate–elect for 2012-2013 last night with 47.69 percent of the vote, beating ChicagoSpirit and Moose Party by a wide margin. Overall, Connect received 1253 votes, ChicagoSpirit 704 votes, and Moose Party 568 votes. ORCSA announced second-year Rohan Manthani and second-year Grace Park have been elected Undergraduate Liaison to the Board of Trustees and Community and Government Liaison, respectively. Second-year graduate student in Public Policy and Middle Eastern Studies Kathryn Hagerman was voted Graduate Liaison to the Board of Trustees. Eleven winners of the College Council (CC) race were also announced, although a tie between 2013 College Council write-in candidates Rebecca Kim and Jenn Cohen will be settled by members of SG. The other three winners for Class of 2013 representative are Sarah Iqbal, John Anton, and Chenab Navalkha. In next year’s CC, Steph Mui, Kristina Brant, Ben Hammer, and Krishna Ravella will represent the Class of 2014, while Vidal Anguiano, Raymond Dong, Yusuf Janahi, and Ezgi Cubukcu will represent the Class of 2015. Overall voter participation increased by 12 percent from last year, with 1824 undergraduates and 803 graduate students casting ballots. Immediately following last year’s spring SG elections, former ORCSA director Sharlene Holly said that one of SG’s challenges was to engage graduate students. Graduate student participation in this year’s election rose by 211 percent, while undergraduate participation in this year’s election dropped by 13 percent, according to figures posted on SG’s website. Fourteen participants, 12 for CC and 2 for liaison positions, joined the races after SG decided to extend the deadline to turn in election petitions from April 10 to April 18. “Extending the petition deadline by another week ensured that the races were competitive, which can only be a good thing for students at UChicago,” said Nakul Singh, chair of SG’s Elections and Rules committee. SG President and fourth-year Youssef Kalad remarked on the novelty of this year’s candidate pool. 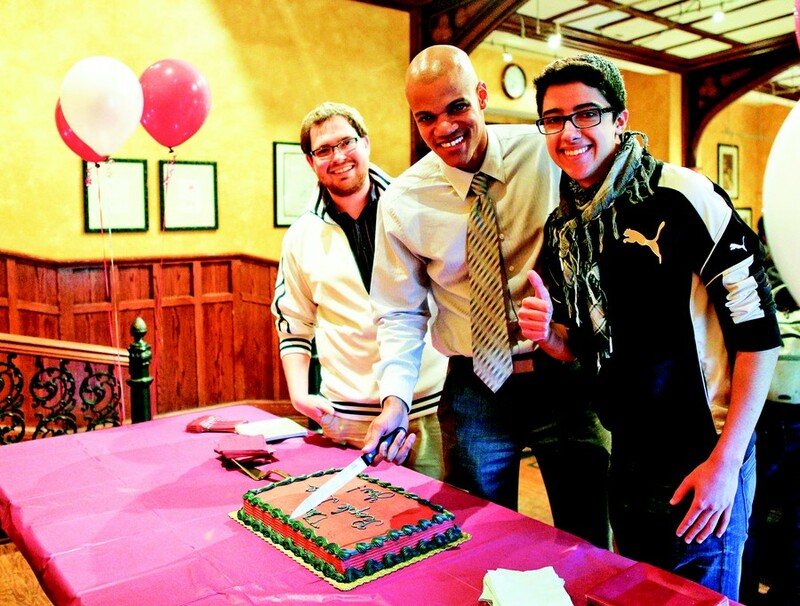 “We had a grad run for slate for the first time in a long time,” he said. Specifically, Kalad identified President-elect Renard Miller’s involvement in Graduate Council and College Council as a reason for the high voter turnout. Miller is currently a second-year Law student. Kalad added that he predicts a smooth transition. “We’ll be working with them for the rest of the quarter…and we anticipate the communication to be stronger than even last year’s,” he said. Vice President–elect for Administration and third-year Douglas Everson promised further consolidation of campus populations and resources, along with increased communication measures. “As evidenced by the voter turnout, grad students have really expressed an interest in getting involved,” Everson said. Everson added that part of increasing communication will include making the campus-at-large aware of pre-existing resources. “Students have been really appreciative of being made known of initiatives, like free Microsoft Office, or $6 movie tickets through Reynolds,” he said. Vice President–elect for Student Affairs and first-year Yusef Al-Jarani also labeled transportation as a perennial concern that the new executive slate hopes to address. Manthani said that once he takes office, he anticipates difficulty in exercising power on the Board of Trustees. However, he plans on trying to meet individually with the board members outside of meetings, frequently blogging to assure accountability, and increasing board transparency.